I saw this post from one of my favorite veteran homeschool mom bloggers. It’s Karen Andreola of Charlotte Mason Companion fame. 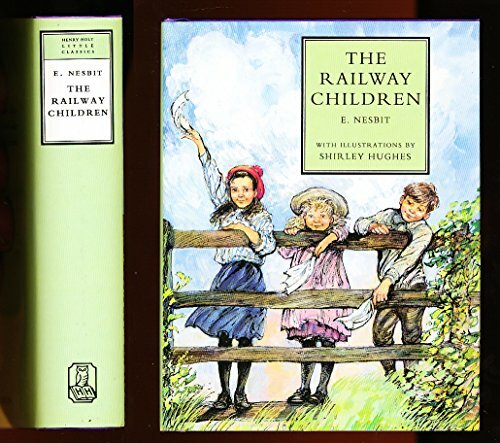 She writes of how The Railway Children is a delightful book about a bygone era when children were free to roam and explore the outdoors. So I put it on hold at my local public library and was delighted to find out that it’s the cutest little book ever! At least at my library. This edition is a “Henry Holt Classic.” It measures about 3 x 4 inches and features the delightful illustrations of Shirley Hughes. The cute size and cute illustrations make me want to read it even more. So I am reading it to the kids during at least one of our daily read aloud times: breakfast dishes, devotional, lunch dishes, dinner dishes, or getting ready for bed. Best of all, it’s free on librivox, and those versions are on youtube, as seen below, so I can play it when I want a break from being the “read alouder.” It is a little slow going, I admit. I think the adventure will pick up soon. This version below is dramatized with different voices so it’s more enjoyable, but it must be abridged, because it’s only 46 minutes. When we are done with it, we will watch the movie that Karen mentions. Here’s a version on Youtube, below. I can’t tell if they are the same. Have any of you read this and what do you think? Is it as grand as Karen paints it out to be? I find it fascinating that the story is based on an episode in Edith Nesbit’s own life. I am bummed to hear from Karen that Edith was “an active socialist and didn’t live the morality she penned.” Sigh. This entry was posted in Uncategorized and tagged book-on-audio, books-to-read-aloud, charlotte-mason-companion, edith-nesbit, karen-andreola, the-railway-children. Bookmark the permalink. Watched the Railway Children. It was so enjoyable. Thanks, Celestia.